In 1387 the Grand Duke of pagan Lithuania married the heir to the throne of Poland, becoming king. The condition placed on the marriage was the Christianization of his lands. In Samogitia, a Lithuanian territory with common languages, traditions and cultures, the work of evangelization began in 1413 with the arrival of a group of priests accompanying the king during a visit. Only four years later in 1417, the Council of Constance decided to create the Diocese of Samogitia, appointing its first bishop. In the centuries that followed, religious practice and life grew, even during the Soviet occupation, although in hiding. The reconstitution of the Republic of Lithuania offered the Diocese of Samogitia new momentum: new congregations and monasteries were founded, new churches were built, and the activities of the seminary were restored. The visit of Saint John Paul II in 1993 contributed further to the religious renewal of these lands. 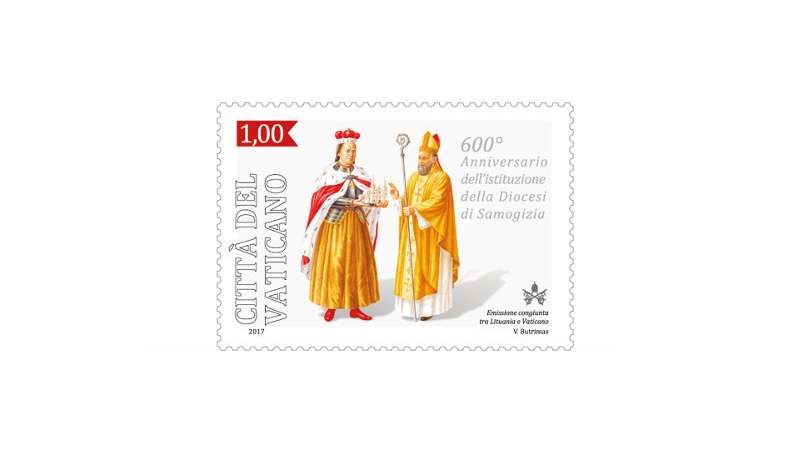 The Philatelic and Numismatic Office is celebrating the 600th Anniversary of the Diocese of Samogitia with a joint issue with the Lithuanian postal service. The postage stamp minisheet issue consists of four values of one euro. Each stamp features a depiction of Lithuanian Grand Duke Vytautas, cousin of the king, and Motiejus, the first bishop of the diocese, both central figures in the years when these lands were being consecrated to Christ. The representation is by artist Vaclovas Butrimas.